If there’s anything on Earth more magical than Yosemite with fresh snow, I haven’t seen it. The problem is, Yosemite Valley doesn’t get tons of snow—its relatively low elevation (about 4,000 feet) means the valley often gets rain when most of the Sierra gets snow. And when snow does fall here, it doesn’t stay on the trees for more than a few hours (if you’re lucky). Which is why I’ve always said the secret to photographing snow in Yosemite is to monitor the weather reports and time your visit to arrive before the storm. This strategy gives photographers within relatively easy driving distance, especially those of us without day job, a distinct advantage—from my home in Sacramento I can be in Yosemite Valley in less than four hours (that’s factoring a Starbucks stop in Merced and a fill-up in Mariposa), and I have no problem using darkness to make the roundtrip on the same day. So last week, when the National Weather Service promised lots of snow in Yosemite for the weekend, I quickly freed up my Saturday. I usually stay just outside the park in El Portal, but because I didn’t want to risk being turned away by a (rare but not unprecedented) weather related park closure, I booked Friday and Saturday nights at Yosemite Lodge, right in the heart of Yosemite Valley—even if the roads shut down, from there I’d be able to walk to enough views to keep me happy all day. I arrived in the dark to find lots of ice and patches of crusty old snow; I woke dark-and-early Saturday morning to about ten inches of fresh snow. Yippie! The snow fell intermittently throughout the day, with conditions ranging from nearly opaque to classic Yosemite clearing storm drama. Since I was by myself, I was able to deemphasize many of the most frequently photographed spots my workshop expect to photograph and explore random scenes along the Merced. In the morning I concentrated on El Capitan scenes; the afternoon was more about Half Dome. Of course the classic views are that way for a reason, so, as you can see in this image, I gave them some attention to. Despite not being much of a tourist location, many photographers know about this scene just upstream from Sentinel Bridge. It’s a little hard to find, but usually fairly accessible. But this time getting there forced me to employ a creative parking strategy and to soil about one hundred yards of virgin powder. At this spot a couple of weeks ago I used a telephoto to isolate a single tree clinging to its fall color and reflecting in the river; this visit was my widest lens that got all the work. Arrive in Yosemite Valley before the storm and plan to stay until it’s over. 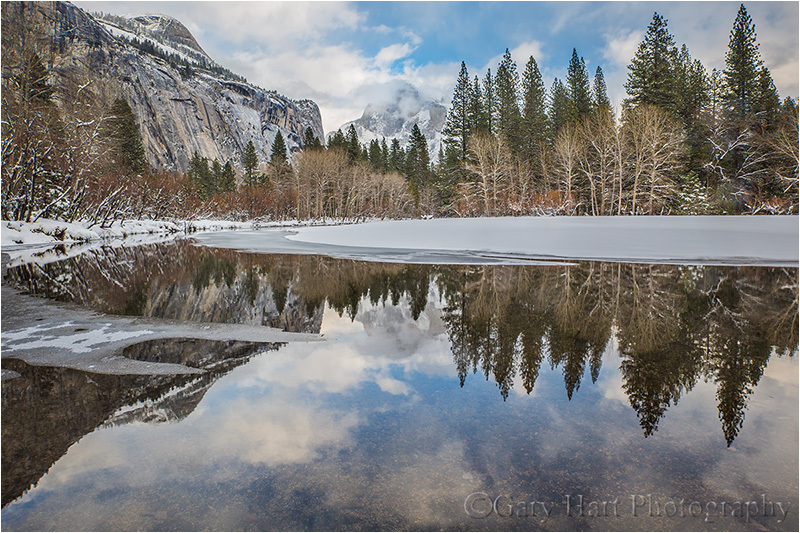 Getting there before the snow starts makes your life so much simpler; staying until the storm passes not only gets you the coveted “clearing storm” images, it also allows you to photograph all of Yosemite’s iconic features above a snow-covered landscape. Despite what Google Maps, your GPS, or your brother-in-law tell you, don’t even think about any route that doesn’t take you through Mariposa and up the Merced River Canyon on Highway 140. The highest point on 140 is Yosemite Valley; all other routes into the park go over 6,000 feet and are much more likely to be icy, closed, or require chains. For people coming from the north that means 99 to Merced and east on 140. Coming from the south, you can either take 99 to Merced (easier) and 140, or 41 to Oakhurst and 49 to Mariposa (faster). Carry chains. While you’re rarely asked unless weather threatens, every car entering Yosemite in winter is required to carry them, even 4WD. While 4WD is usually enough to avoid putting chains on, that’s not a sure thing. And if you get caught in a chain check without them, you’re parked right there until the requirement is lifted. If you’re driving your own car to Yosemite, bite the bullet and purchase chains. If you’re flying into California and renting a car, try to get 4WD and keep your fingers crossed that you don’t get asked. Some people will purchase chains and try to return them if they didn’t use them, but that can be risky so check the store’s chain return policy. Don’t hole-up in your room while it’s snowing. I generally circle the valley looking for scenes (about a 30 minute roundtrip). If the low ceiling has obscured all the views and you tire of photographing close scenes, park at Tunnel View and wait. Not only is Tunnel View the location of some of Yosemite’s most spectacular clearing storm images, it’s also the first place storms clear. And because you’ll be stunned by how fast conditions in Yosemite can change, waiting at Tunnel View is the best way to avoid missing anything. Another advantage Tunnel View offers is its panoramic view of the entire valley that helps you to decide where to go next. For example, from Tunnel View you can see if Half Dome is emerging from the clouds and there are probably nice images to be had on the east side, or if your best bet will be to stay on the west side and concentrate on El Capitan, Bridalveil Fall, and Cathedral Rocks. No matter how spectacular the view is where you are now, force yourself to move on after a while because it’s just as spectacular somewhere else. Trust me. Gorgeous – wish I were there! The biggest snowflakes I’ve ever seen were in Yosemite (a few decades back).